↑ 1,0 1,1 1,2 Jean-Marc Lamotte. 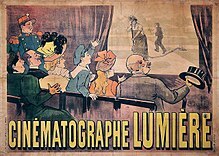 Lumière et fils // Encyclopedia of Early Cinema / Richard Abel (Ed.). — Routledge, 2005. — P. 396-398. — ISBN 0-415-23440-9.